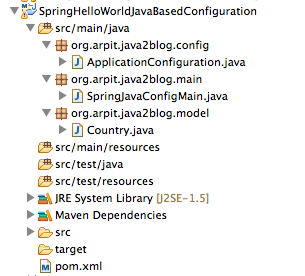 In this post , we will see how to configure spring with java based configuration. In previous post, we have already seen how to configure spring using xml configuration. Spring provides @configuaration and @Bean annotation for java based configuration. 1. Create a simple java maven project. put spring and cglib maven dependency in pom.xml. Create a bean class called country.java in package org.arpit.java2blog.model . This class will have @Configuaration and @Bean annotation . Bingo!! we are done with spring java based configuaration.